In 2015, Sacred Heart School alumnus Robert Reinke clambered away from financial management and landed in the arts. “That wasn’t my calling. I always wanted to get into the creative realm,” said Reinke, a parishioner at St. Peter’s Catholic Church in Forest Lake with his wife, Anna, and children, Michael (2 ½ years old) and Annie Grace (8 months). In 2014, the Reinkes’ oldest child, Benjamin — born prematurely — departed this life. Reinke wondered what he could learn from this difficult season of life. “I discovered that, outside of time, Benjamin found his mission in four short months, inspiring me to turn dreams into goals,” Reinke said. Reinke desired to work with the Church in media. He soon founded his company, Majesty Creations, specializing in marketing videos for small businesses, nonprofits and Catholic schools, including the Catholic Schools Center of Excellence (CSCOE). Benjamin inspired another goal — to write a modern classic novel. So last summer, Reinke released The Mountaineer, a suspense novel set in the Rockies where icy roads catapult a teenager’s car over a ridge. Reinke’s Catholic school education was the foundation for the story, and he chiseled life lessons onto the pages, hoping readers harness them. At his alma mater in Robbinsdale, sixth through eighth graders have read it. 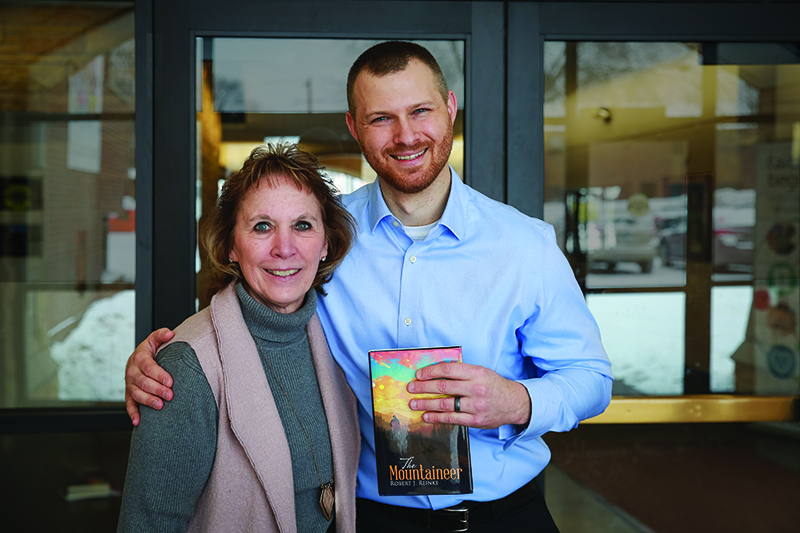 Principal Karen Bursey, who once taught Reinke, is proud to offer a novel from a Sacred Heart graduate that’s rooted in faith.